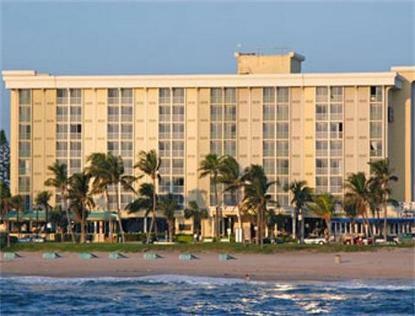 Howard Johnson Plaza Resort of Deerfield Beach/Boca Raton is a full-service resort hotel located on the No. 1 beach in Broward County, Greater Fort Lauderdale. This two-time winner of the Howard Johnson Plaza Hotel Of The Year Award is situated in a village-like atmosphere and is surrounded by over 12 restaurants and lounges, as well as shops and rental place for scooters, bicycles and water sports equipment, all just steps away. Conveniently located midway between Palm Beach and Fort Lauderdale and adjacent to Boca Raton, it is an unspoiled oasis surrounded by South Floridas hottest attractions, exciting night life and excellent shopping.The hotel features a new heated Pool and a large Jacuzzi, newly renovated Patio Bar and Grill featuring live entertainment, overlooking the ocean and serving a new, exciting menu as well as a large selection of refreshing drinks. A Business Center free to the guests as well as a free wireless Internet Service. We also have a fitness room and free newspaper during the week. The Parking fee is 10.00 per day.